Precarious work includes temporary foreign labour, service industry jobs, food services and accommodation jobs, temporary agency work and self-employment (Law Commission of Ontario, Quick Facts About Vulnerable Workers and Precarious Work ). It seems that part-time, casual and temporary work have become quite common in Canada. And, the LCCO notes that women, racialized persons, immigrants, Aboriginal persons, persons with disabilities, older adults and youth are disproportionately represented in the category of vulnerable workers. Other scholars add undocumented workers and refugees to the category of temporary foreign labour as precarious workers . The Law Commission study identified the following problems. Precarious work can have significant negative physical and mental health outcomes for people. …women, racialized persons, immigrants, Aboriginal persons, persons with disabilities, older adults and youth are disproportionately represented in the category of vulnerable workers. Recent immigrants are more likely to be engaged in physically demanding work. Health and safety risks also arise from lack of experience or training, lack of knowledge about health and safety rights, and fear of losing the job or being deported. Precarious work can cause stress because of job insecurity, the pressure of holding more than one job, the irregular or long hours, lack of legal protections and insecure visa status. Low income experienced by precarious workers can also have health consequences. In addition to susceptibility to illness and injury, precarious workers may not have access to safe transportation or to nutritious food. Lack of benefits and low wages may preclude purchase of prescription drugs and other medicines. Pregnant women may not be covered by statutory emergency leave provisions and may not be able to get sufficient time off for medical care. Limited training or education opportunities of precarious workers also limits their ability to upgrade skills that are needed to obtain more stable and better paid work. 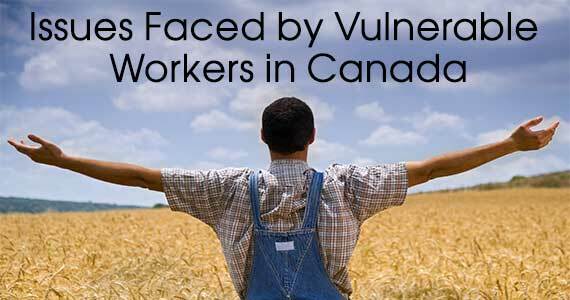 In Alberta, waged agricultural workers are often considered precarious workers. In addition to facing hazardous working conditions and below-average wages, they also are excluded from many of the statutes that would protect workers. In 2008, the Alberta Federation of Labour estimated that there are approximately 12,000 waged agricultural workers in Alberta, with 2,600 working in a temporary or seasonal capacity. In December 2012, there were over 68,000 temporary foreign workers in Alberta. Premier Jim Prentice recently expressed concern that new rules to limit the number of temporary foreign workers would be seriously affecting rural Alberta, including agriculture. In Alberta, waged agricultural workers are often considered precarious workers. In addition to facing hazardous working conditions and below-average wages, they also are excluded from many of the statutes that would protect workers. At the same time, Alberta Federation of Labour’s Gil McGowan says that there is a shortage of workers because the temporary foreign workers are underpaid. This drives wages down, which in turn serves as a disincentive for Canadians to take the jobs. This then creates more demand for temporary foreign workers. If one looks across Canada, precarious agricultural workers have less protection in Alberta than elsewhere in the country. Most of the basic statutes in Alberta that apply to workers, do not apply to waged agricultural workers. The exception is the Alberta Human Rights Act which applies to “persons” in Alberta. Yet, waged agricultural workers face many barriers, including not being aware of their rights under this legislation, or being fearful of exercising these rights, especially if they are temporary foreign workers. Alberta’s Employment Standards Code protects workers with respect to their hours of work, overtime and overtime pay, general holidays and holiday pay, vacations and vacation pay, restrictions on children under 18 working, and minimum wage. If one looks across Canada, precarious agricultural workers have less protection in Alberta than elsewhere in the country. Most of the basic statutes in Alberta that apply to workers, do not apply to waged agricultural workers. Provisions regarding termination notice and parental and maternity leave do apply to agricultural workers, which are listed as those employed on a farm or ranch whose employment is directly related to the primary production of eggs, milk, grain, seeds, fruit, vegetables, honey, livestock, game-production animals, poultry, bees or cultured fish. However, the other provisions of the Code do not apply to agricultural workers (section 2(4)). The Alberta Labour Relations Code regulates unionization and collective bargaining for workers. However, similar to the Employment Standards Code, agricultural workers are not covered under these provisions. The Alberta Occupational Health and Safety Act provides standards for the health and safety of workers. Farming and ranching operations are excluded from the definition of “occupation” and this means that agricultural workers are not protected by this legislation. David Swann (Liberal MLA) says that 18 to 20 farm workers are killed in workplace incidents every year and there have been 550 fatalities over the last ten years. It would appear that health and safety legislation would be very appropriate in this context. Finally, Workers’ Compensation coverage is not mandatory for farm workers, although their employers can purchase optional. David Swann (Liberal MLA) says that 18 to 20 farm workers are killed in workplace incidents every year and there have been 550 fatalities over the last ten years. If there is no workers’ compensation coverage, agricultural workers are left to sue in court for their injuries or to purchase their own insurance, an option that they do not usually access . Their immigration status is also precarious, and they are vulnerable to marginalization and mistreatment. All of these challenges may lead to the failure to partake of any legal protections that these precarious workers may have. The Canadian Charter of Rights and Freedoms was used to challenge the lack of protections in legislation for agricultural workers in Ontario (Attorney General) v Fraser, 2011 SCC 20. Ontario had passed separate labour relations legislation (Agricultural Employees Protection Act, 2002 (AEPA)), which excluded farm workers from the Labour Relations Act, but included a separate labour relations system for farm workers. The AEPA grants farmers the right to form and join and employees’ associations, to participate in its activities, to assemble, to make representations to their employers through the association about their terms and conditions of employment, and to be protected against interference, coercion and discrimination in the exercise of their rights. Associations are given the opportunity to make representations regarding the terms and conditions of employment, and the employer must listen to them. A tribunal hears and decides disputes about the application of the AEPA. After trying to use the new AEPA, Ontario farmers mounted a constitutional challenge, arguing that the AEPA infringed farm workers’ rights under sections 2(d) (freedom of association) and 15 (equality) of the Charter. They argued that the AEPA failed to provide effective protection for the right to organize and bargain collectively and excluded farm workers from the protections accorded to workers in other sectors. …farm workers usually are only protected by the common law employment contracts they enter into with their employers, and these usually advantage the employers. The Supreme Court of Canada held that the procedures in the AEPA did not violate Charter section 15 or section 2(d). The SCC noted that the fact that there is a different legislative system for agricultural workers in Ontario does not mean that farm workers in Ontario are not entitled to meaningful processes by which they can pursue workplace goals. In writing about the Fraser case, James Gross  stated that discussions surrounding the case “provide painful but necessary reminders that workers’ rights, in regard to their realization and enforcement, have at best a fragile and perilous existence”. Thus, farm workers usually are only protected by the common law employment contracts they enter into with their employers, and these usually advantage the employers (Barnetson, at 53). forming an Innovative Solutions for Precarious Work Advisory Council to explore options for benefits for non-standard and other workers without coverage. creating a complaints mechanism (e.g., anonymous complaints hotline). creating a provincial strategy involving multiple stakeholders to engage in comprehensive and coordinated initiatives. Many of these recommendations would be applicable throughout Canada, where significant numbers of vulnerable workers, including agricultural workers, have very limited legal protections, yet face dangerous working conditions and lower wages. 2. Bob Barnetson (2009) “The Regulatory Exclusion of Agricultural Workers in Alberta”, Just Labour: A Canadian Journal of Work and Society 14.